African journalists participating in the 2016 Edward R. Murrow Program for Journalists "meet the press" at the internationally-recognized "Journeys in Journalism" program, John Hopkins Middle School, St. Petersburg, Florida. 34 Countries. 36 "New Voices". ReportingThe World. 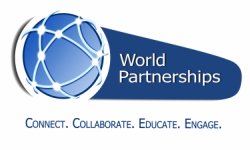 The World Partnerships mission to “connect people, ideas and projects” among its 4,000+ New Generation alumni seeks new ways to collaborate and “complete the exchange” that started with the IVLP program in Tampa Bay. World Partnerships stays connected with its alumni and connects its alumni with each other throughout the world. They are part of a unique network of individuals changing the world. And they have a lot to share with each other. - Publish news from around the world. - Share information about their work and projects. - Connect with fellow alumni from around the world to share techniques, best practices and create virtual collaborations over the Internet. Guiding the creation and evolution of this communications platform and network are 36 “New Generation” journalists, broadcasters, writers and civil society activists who volunteer their time and energy with the World Partnerships “New Voices Advisory Council”. They come from Africa, Asia, Europe and the Western Hemisphere. They are joined by journalists, bloggers, social media experts and others who are long-time supporters of World Partnerships. The Advisory Council has been instrumental in the re-imagining of our website and social media platforms. Over time, our alumni will be able to communicate with you and with each other via diverse forms of social media – Twitter, Facebook, LinkedIn, Pinterest, & Tumblr, among others. Click here for our Twitter feed, and click here for our Facebook page! Keep an eye on the map, and watch the World Partnership “New Voices” network grow! See how World Partnerships alumni Change the World!